address will be posted after 5pm the day before the inspection, Herndon VA . PLEASE READ THESE TERMS OF SALE CAREFULLY, AS THEY HAVE BEEN RECENTLY UPDATED. THIS IS AN INTERNET–ONLY AUCTION! AUCTION CLOSING DATE: Friday, April 12th Bidding closes on the first item at 12:07 pm, then closes at the rate discussed in these Terms and Conditions of Sale. AUCTION HOST: R.L. Rasmus Auctioneers, Inc. These are the Terms and Conditions of Sale for this online auction. They consist of this introduction and thirty-one numbered paragraphs that outline the relationship between you (“the Bidder”), the operator of this website (identified above as the “Auction Host”), and the party coordinating the logistics of this online auction (identified above as the “Auction Manager”). The Auction Manager and the Auction Host are together referred to in these Terms and Conditions as “the Auctioneer,” and any reference to action that may be taken with respect to the Auctioneer may be taken with respect to the Auction Host or Auction Manager separately or collectively. Throughout these Terms and Conditions, the terms “Auctioneer,” “we,” “us,” and “our” will refer to the Auctioneer, and the terms “you” and “your” will refer to the Bidder. If you want to bid in this online auction, you will first have to certify that you have read, understood, and agreed to these Terms and Conditions. Such certification will function as your legal and binding electronic signature. If you choose to make this certification, these Terms and Conditions will become binding both on you and on the Auctioneer, and all parties will be expected to abide by the Terms and Conditions if any issues arise in connection with this sale. Please read these Terms and Conditions carefully! They contain important information about the online auction itself and your rights and responsibilities as a bidder. 1. Registration: To gain access to the Auctioneer’s bidding system, you will need to register and obtain a bidder number. You must be eighteen years old or older to register. You agree that all information that you provide during the registration process will be true and accurate. You may be banned from participation in the Auctioneer’s auctions indefinitely should you provide any false information during the registration process. 2. Applying for Tax-Exempt Status: Some bidders may be exempt from payment of applicable taxes. If you wish to apply for tax-exempt status, you must submit a completed copy of the Auctioneer’s tax-exempt form prior to this auction’s closing. You can find the form here. Please note that the Auctioneer requires bidders to submit a new tax-exempt form for every sale. Once you have completed your tax-exempt form, please submit it to the Auctioneer using the online form available at this link. If you do not follow the procedures discussed in this paragraph, the Auctioneer will be unable to consider identifying you as exempt from taxation, and you will have to apply directly to the applicable state for a refund. Please also note that, depending on the state whose sales tax applies, submission of the Auctioneer’s tax exempt form may not be sufficient to entitle you to tax-exempt status. Please review the form and its contents carefully, and contact the Auctioneer with any questions you may have. 3. Deposit: In order for the Auctioneer to process your winning bid, we must have a working Visa or MasterCard associated with your account. (a) If you associate a credit card with your account: After you have registered for this online auction, the Auctioneer will authorize the credit card you have placed on file for $1.00. This $1.00 deposit is not a charge, only an authorization hold; if you decide not to make any bids during this auction, or if none of your bids are successful, the Auctioneer will not take any money from your account, and the authorization hold on your $100.00 will be lifted in accordance with the procedures of your credit card provider and/or banking institution. If you fail to provide full payment for your purchases, the $100.00 authorization hold will be captured and applied toward your outstanding balance. (b) If you associate a debit card with your account: After you have registered for this online auction, the Auctioneer will charge your debit card for the amount of $1.00. If you decide not to make any bids during this auction, or if none of your bids are successful, this $1.00 will be refunded to your account. 4. Bidder’s Duty to Update Information: Whether you are a new or returning bidder, you agree that if any of the information associated with your bidder number – including contact information and credit card information – changes at any time prior to, during, or after this sale, you will notify the Auctioneer of the change by updating your bidder profile using this link. 5. Conduct of Sale: All deposits, bids, credits, and fees in this sale will be made and charged in United States Dollars. You agree not to take any action or use any hardware, software, program, or system that would interfere with the orderly conduct of this sale. You further agree not to copy, reproduce, or publically display any content from the Auctioneer’s website without first obtaining written permission from the Auctioneer. 6. Bidder’s Duty to Inspect and Investigate: You acknowledge that the Auction Manager is providing you with the opportunity to inspect the items being offered for sale in this auction. The Auctioneer strongly encourages you to attend the scheduled inspection for this auction, which will take place on the date listed above. If you choose not to attend the scheduled inspection or are in doubt about the condition, completeness, or suitability of a given item, please bid accordingly. 7. Photographs and Descriptions: The Auction Manager regularly posts item descriptions and photographs to aid bidders in the bidding process, and will make every effort to ensure that the descriptions and photographs that we post accurately represent the items being offered for sale. In some photographs, multiple items may appear to be joined as a single unit, however you should not assume that a lot consists of more than one item simply because various items appear connected or are featured in the same photograph. Also understand that, on occasion, the wrong photograph may be displayed for a given item. At all times, you are bidding on items as they are described, not as they appear in any photograph. 8. CHOOSE WISELY: We want everyone to get a good deal and most will. However, when you bid on the wrong item or decide an item is not suited for your intended use, our clients will not assume the cost of your mistakes. You agree that your failure to inspect or otherwise become fully informed about the items offered for sale in this auction will not be grounds for a refusal to pay amounts due, nor for any claim against the Auctioneer. 9. WARRANTY AND CONDITION OF ITEMS SOLD: ALL LOTS AND ITEMS ARE SOLD AS IS, WHERE IS, WITH ALL FAULTS, AND WITH NO EXPRESS OR IMPLIED WARRANTIES. THIS SALE IS A SALE TO THE BUSINESS COMMUNITY OF “EQUIPMENT” AND “INVENTORY” WITHOUT ANY EXPRESS OR IMPLIED WARRANTIES. NO ACTION TAKEN BY THE AUCTIONEER OR ITS AGENTS WILL OR IS INTENDED TO CREATE ANY EXPRESS OR IMPLIED WARRANY AS TO ANY LOT OR ITEM IN THIS SALE. THE AUCTIONEER SPECIFICALLY DISCLAIMS ANY EXPRESS OR IMPLIED WARRANTIES INCLUDING, BUT NOT LIMITED TO, ANY WARRANTY OF MERCHANTABILITY, FITNESS FOR A PARTICULAR USE, CONFORMITY WITH ENVIRONMENTAL LAWS OR REQUIREMENTS, NON-INFRINGEMENT, ACCURACY, TITLE, OR ANY OTHER STATUTORY OR COMMON LAW WARRANTY. THE AUCTIONEER FURTHER DISCLAIMS ANY RESPONSIBILITY FOR LIENS OR ENCUMBRANCES THAT MAY ATTACH TO OR BE ASSOCIATED WITH ANY LOTS OR ITEMS. ANY SUCH LIENS AND ENCUMBRANCES ARE THE RESPONSIBILITY OF THE BIDDER TO INVESTIGATE. IT IS BELIEVED THAT ALL DESCRIPTIONS ARE ACCURATE, BUT DESCRIPTIONS ARE NOT GUARANTEED. THE AUCTIONEER FURTHER DISCLAIMS ANY LIABILITY FOR ANY TECHNOLOGY-RELATED LOCK, IMPEDIMENT, OR ENCUMBRANCE ASSOCIATED WITH ANY LOT OR ITEM. THE AUCTIONEER HAS NO OBLIGATION TO PROVIDE ANY PASSWORD, LICENSE, TECHNICAL SUPPORT, OR OTHER TECHNOLOGY-RELATED SERVICE, PRODUCT, OR THING ASSOCIATED WITH ANY LOT OR ITEM. 10. Reporting Bidding Errors: You should refresh your browser often to view the most up-to-date bid information, and should carefully review every bid you choose to make before submitting that bid. The Auctioneer will not automatically assume that any bid – even a bid that increases your own, lower bid – was made in error. Many bidders routinely increase their own bids to price an item out of the reach of other bidders. You understand and agree that you will be held responsible for having made all bids that are made using your account information ‒ even when such bids are made in error. If you mistakenly increase your own bid at any time during the auction, or make some other bidding error (e.g. placing your bidder number in the price field), you must immediately contact the Auctioneer using the online form available via this link. Reports of bidding errors must be made via the online web form; phone reports will not be accommodated. In every event, you are responsible for bids submitted using your account and bidder number, including any bids made in error. 11. Timeliness of Bidding Error Reports: If you make a bidding error during this auction, you must identify and report the error before the auction begins to close. The Auctioneer has no obligation to undo bidding errors reported after the auction has begun to close. 12. Bidder’s Duty to Report Fraud: You are responsible for all bids made from your account. If you believe that an unauthorized person has gained access to your account, you must notify the Auctioneer immediately using the online form available via this link. You must also report the incident to the relevant law enforcement authorities and send the Auctioneer a copy of any resulting police report. You understand and agree that if you do not promptly report any suspected fraud to the Auctioneer and to the relevant law enforcement authorities, you will be held personally responsible for all purchases made using your account and bidder number. (a) add or remove items from the auction, (b) split or combine lots, (c) add minimum bids or reserve prices, (d) cancel, suspend, extend, or reschedule the sale of an individual item, lot, auction, and/or auction event, (e) make changes to the auction’s closing, inspection, or removal times, or (f) take any other action the Auctioneer deems necessary to effect the fair conduct of this sale or protection of buyers’, sellers’, or other parties’ interests. In the event a seller withdraws an item from this auction prior to the close of the auction, the Auctioneer may leave the item on the catalog and buy the item back on behalf of the seller to establish the Auctioneer’s earned commission and the buyer’s premium due to the Auctioneer from the seller. 14. Closing: The Auctioneer’s online auctions are designed to mimic traditional “live” actions. For this reason, this auction will have a staggered, dynamic closing. You must continuously refresh your browser during the closing process to see the most current activity on your items, both prior to placing your bid and after submitting your bid. 15. Winning Bids: If you place a bid in this sale, and your bid is determined to be the winning bid, you become obligated to pay for the item that you have won at the price you gave as your bid. (a) Notification: If you end up placing one or more winning bids in this auction, the Auctioneer will charge your credit card on file and then send you a Paid Sales Receipt. Invoices are not sent as soon as the auction begins closing; they are generally sent out by the end of the business day on which the auction closes. If the Auctioneer is unsuccessful in charging your credit card on file, you will be sent an e-mail with instructions directing you to log in to your profile and update it with another credit card that can be charged. If your credit card information has been updated and you still do not receive your Paid Sales Receipt, be sure to check your Spam or Trash e-mail folders. You are solely responsible for checking your e-mail following the close of the auction to determine what items you have won and for bringing the Paid Sales Receipt to the removal with you. If you do not receive an e-mail identifying you as a winning bidder, it is because the Auctioneer has no record of your having placed a winning bid. 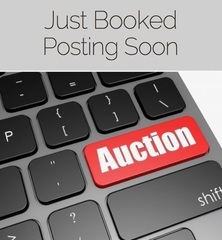 (b) Bid Inquiries: If you believe that you placed a winning bid, but do not receive an e-mailed invoice, you must notify the Auctioneer by means of the online web form and explaining your situation by 9:00 am EST on the day after the auction has closed. You agree that the Auctioneer will be the sole authority regarding the identification of winning bids. (a) Suspension: You understand and agree that if, at the end of this auction, the Auctioneer is twice unable to charge your credit card for the entire amount of your purchases, the Auctioneer may suspend your online bidding privileges indefinitely. The Auctioneer may reinstate suspended accounts in the Auctioneer’s sole and absolute discretion if the suspended bidder remits a $1000 deposit to be held in escrow for a period of one year. 17. Buyer’s Premium: A 15% buyer’s premium is added to every purchase. This means that if your winning bids add up to $100.00, you will be charged $115.00 + sales tax, at checkout. 18. Sales Tax: Sales tax will be collected on items purchased at this auction. Remember: if you are tax exempt, you must follow the procedures discussed in Paragraph 2 to apply for tax-exempt status. (a) any cost associated with the resale and (b) any deficiency between your original purchase price and the resale price. 20. Picking Up Your Items: You are solely responsible for the safe and timely pick-up and removal of any items you may win at this auction. If you are unable to safely pick up and remove your items during the removal times that have been scheduled for this sale, PLEASE DO NOT BID. The Auctioneer does not ship except when a given item is clearly identified as eligible for shipping, nor does the Auctioneer hold items beyond the published removal times. The Auctioneer is not obligated to issue you a refund if you are unable to pick up and safely remove your items during the published removal times. If a given item is identified as eligible for shipping, please follow the specified instructions to arrange for shipping. (a) Bidder’s Duty to Remove Items Safely: Again, you are solely responsible for the safe pick-up, removal, and transportation of your items. You agree that the pick-up, removal, and transportation of your items will be solely at your expense and at your risk. You further agree that you will be responsible for any damage that you or any of your agents cause during any preview or removal period, and also agree that the credit card associated with your online account may be charged for any expenses incurred and/or repairs necessary as a result of any damage that you cause. (c) Abandonment: You understand and agree that any item that you do not pick up during the published removal times will be considered abandoned. You understand and agree that you will not receive any refund in connection with any item that is considered abandoned, and that you will be charged a reasonable fee for the storage, removal, and/or disposal of any such item. (d) Discretionary Late Removal Policy: The Auctioneer may, in the Auctioneer’s sole and absolute discretion, allow you to remove an item that you have won at auction at a time beyond the published removal times in exchange for a late removal fee (the “Late Fee”). The Late Fee with respect to any given auction will equal $150 for the first hour during which the Auctioneer agrees to allow items to be removed late, and $50 for every additional hour during which the Auctioneer agrees to allow items to be removed late. For avoidance of doubt, (i) the minimum Late Fee with respect to any given auction is $150, (ii) the Auctioneer is not required to allow the late removal of any item, and (iii) if the Auctioneer does allow for late removal, the Auctioneer is not required to allow for the late removal to continue for any given amount of time, and may set an end time for such late removal in the Auctioneer’s sole and absolute discretion. Any item not removed during the period during which the Auctioneer agrees to allow for late removal will be considered abandoned, pursuant to the terms of the foregoing paragraph. 21. Disposal of Unclaimed Items: In the event you refuse to pay for or abandon any item that you win at auction, the Auction Manager will have the option of reselling, removing, storing, or disposing of the unpaid-for or abandoned item. You understand and agree that you will be personally responsible for all deficiencies – and all legal, collection, transportation, and storage expenses – associated with your delinquent account and/or abandoned items. In the event of resale, you agree to pay any cost associated with the resale as well as any deficiency between your original purchase price and the resale price. 22. Claims for Non-Delivery: In the unusual event that an item has been totally mis-described or is unavailable for pickup during the published removal times, you must immediately notify the Auction Manager’s onsite staff of the problem and file a claim for non-delivery within twenty-four hours. You understand and agree that if you fail to make a claim for non-delivery with the Auction Manager’s onsite staff within twenty-four hours of your discovering the problem, your claim for non-delivery will not be honored. Claims for non-delivery must be filed by using the contact form on the website. Your claim must include your invoice number, the item number in question, and must fully describe the nature of the problem that you have identified. 23. Claims and Choice of Venue: Any claim or controversy arising out of or relating to these Terms and Conditions, or to any breach thereof, will be resolved exclusively by a state court having jurisdiction in Fairfax County, Virginia, or in the Federal District Court for the Eastern District of Virginia, where federal jurisdiction exists. Each party hereby submits to the jurisdiction and venue of such courts. You agree that all claims instituted by you will be litigated on an individual basis, and will not be consolidated with any claim made by another party. You agree that any judgments awarded may be applied to and collected from you personally or corporately. Should you file an action contrary to this paragraph, the defending parties may recover reasonable legal fees and costs. Further, if you bring a claim against the Auctioneer and do not prevail, and/or if the Auctioneer takes action against you as a result of your violation of these terms and conditions and is the prevailing party, you agree that you will reimburse the Auctioneer for all reasonable legal fees and costs including reasonable attorney’s fees. 24. Interim or Preliminary Relief: You agree that the Auctioneer may seek interim, preliminary, or injunctive relief without the necessity of any bond or similar deposit in a court having jurisdiction. 25. Suspension of Bidding Privileges: You understand and agree that any violation of these Terms and Conditions — and/or any unsafe or illegal activity during any auction-related event — may result in the Auctioneer’s suspending your online bidding privileges indefinitely. Nothing in this paragraph will limit the Auctioneer’s right to any other remedies at law or in equity. 26. Liability: In all cases, the Auctioneer’s liability, and the liability of the seller of the items in this auction, will be limited to the refund of your purchase price. The Auctioneer will not be liable for any amount in connection with the postponement or cancellation of this auction, or the withdrawal of any item or lot from this auction. In no event will the Auctioneer be liable for lost profits or any special, incidental, or consequential damages arising out of or in connection with this auction or any related sale or transaction. (b) No Liability for Site Malfunction: You understand that this auction is online-only, and so relies on devices, software, and programs that may malfunction without warning. You agree that the Auctioneer will not be liable for any error or inconvenience that may be the result of such a malfunction. You further understand and agree that the Auctioneer may void or suspend any sale, or resell any item, if the Auctioneer determines a transaction to have been affected by any site malfunction or human error relating to the site. In no event will the Auction Host have any duty or responsibility to the bidder not directly related to the function of the site. Auctioneer does not promise that the website, or any content, service, or feature of the website and/or any software or application of the website (collectively “Services”) will be error-free or uninterrupted, or that any defects will be corrected, or that your use of the Services will provide specific results. Auctioneer cannot guarantee the continuous operation of or access to its Services. Bid update and other notification functionality on the website may not occur in real time and is subject to delays beyond Auctioneer’s control. You understand and agree that you are making use of the Services at your own risk, and that the Services are delivered on an “as-is” and “as-available” basis. Accordingly, to the extent permitted by applicable law, Auctioneer disclaims all express or implied warranties, terms and conditions including, but not limited to, implied warranties of merchantability, fitness for a particular purpose, and non-infringement. To the extent permitted by applicable law, Auctioneer is not liable, and you agree not to hold Auctioneer responsible, for any damages or losses (including but not limited to any special, indirect, incidental, or consequential damages), resulting directly or indirectly from: (i) the content you provide (directly or indirectly) using the Services; (ii) your use of or your inability to use the Services; (iii) delays or disruptions in Services; (iv) viruses or other malicious software obtained by accessing or linking to Services; (v) glitches, bugs, errors, or inaccuracies of any kind in Services; and (vi) damage to your hardware device from the use of any Service. Some jurisdictions do not allow the disclaimer of warranties or exclusion of damages, so such disclaimers and exclusions may not apply to you. You assume total responsibility for your use of the website, and your sole remedy against Auctioneer for dissatisfaction with the Services is to stop using the website or any such Services. Regardless of the previous paragraphs, if Auctioneer is found to be liable, Auctioneer’s liability to you or to any third party is limited to the refund of your purchase price. c. No Liability for User Equipment Malfunction. You have sole responsibility for ensuring that any software or equipment you use to access the Services are in good working order, and that any internal or external time mechanisms associated therewith are synced to the time zone from which you are bidding. Auctioneer will not have any liability relating to the malfunction of any Bidder software or equipment, or any failure to set any time mechanisms to the appropriate time. 27. Indemnification: You agree to indemnify, defend, and hold harmless the Auctioneer and its employees, officers, owners, affiliates, agents, and representatives from and against any claims, losses, damages, liabilities, judgments, fees, costs, and expenses, including reasonable legal fees and costs, related to, arising from, or associated with you, your agents or representatives – including, but not limited to, personal injury or property damage caused at any sales site or during removal or transportation of items won at auction, any dispute with another bidder, or any violation of these Terms and Conditions. 28. Limitations: These Terms and Conditions do not – nor are they intended to – create any agency, partnership, joint venture, employer-employee, or franchisor-franchisee relationship. These Terms and Conditions cannot be altered except in writing by the Auctioneer. 29. Severability: If any term, provision, paragraph, condition, or other portion of this agreement – or the application of these to any person, place, or circumstance – is held to be invalid, unenforceable, or void, the remainder of this agreement and such term, provision, covenant, or condition as applied to other persons, places, and circumstances will remain in full force and effect. 30. Governing Law: These Terms and Conditions will be governed by and construed under the laws of the Commonwealth of Virginia. 31. Entire Agreement: These Terms and Conditions contain our entire agreement and supersede any prior oral or written agreements relating to the same subject matter. Born in the Barn and raised to the Cloud, BidNow Auctioneers & Asset Advisors was formed by 3rd generation auctioneer, Tim Lile, to offer more efficient and effective asset-recovery solutions for clients by exposing their assets far beyond the local market. In response to the digital revolution, BidNow has teamed with industry leaders across the United States to provide a comprehensive recovery system combining the benefits of traditional liquidation approaches with the coherence and affordability of online auctions. BidNow is able to minimize expense and maximize recovery by bringing the auction bidding and buying experience to Anyone, Anywhere, Anytime!